Company LuxPRO is one of the leading manufacturers of the temperature controllers. Due to the great attention paid to the quality of products, their customers receive the highest quality products. Today, let’s have a closer look at two of them PSP511LC and PSD010B. 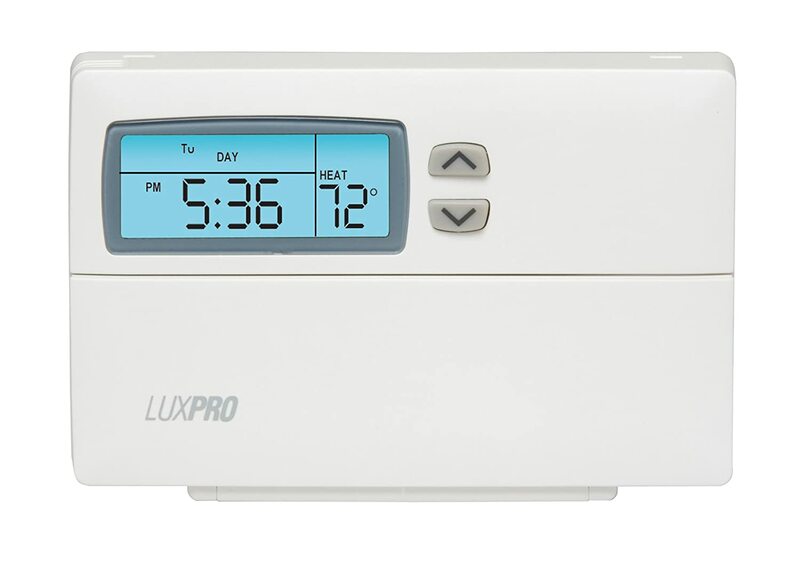 LuxPRO PSP511LC is a programmable home thermostat designed for effective control of the heating system, which allows you to maintain the optimum temperature when you are at home and saves energy in your absence. The pleasant fact is that temperature control range of this model is wide enough: 7-32°C or 45-90°F. By purchasing the PSP511LC, you will get different temperature regimes during the day for weekdays and weekends. For example, you can set the temperature reduction in the daytime on weekdays during the period of your absence, and temperature increase to the set level before you return home. Due to such use of the timer, you can avoid wasting heat. The universalism, ease of operation and programmability allow the use of temperature control in almost all 24v gas, oil, electric heating and cooling systems including single stage heat pumps. 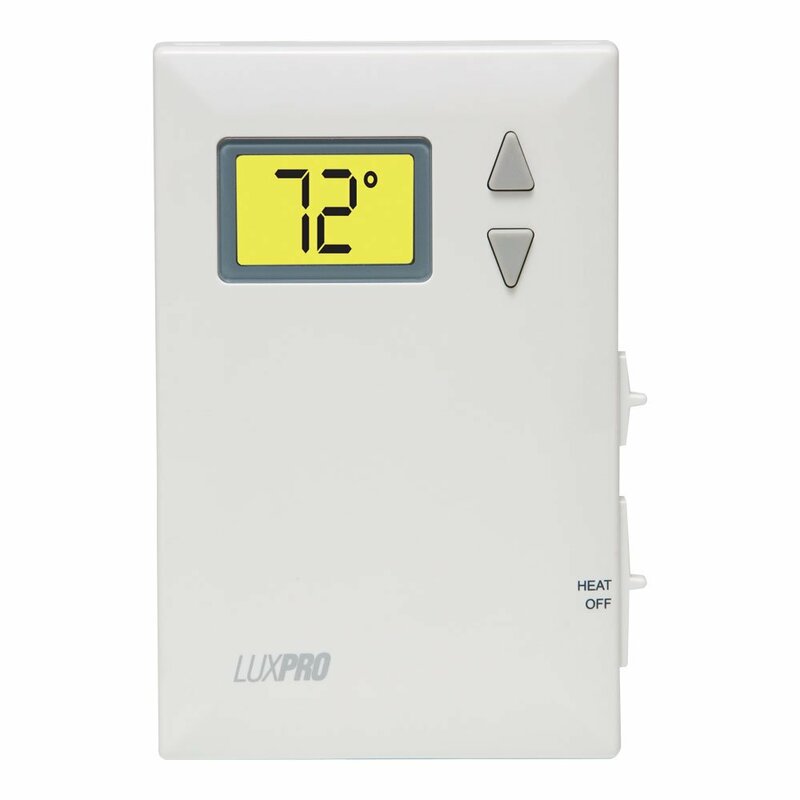 LuxPRO PSP511LC thermostat allows you to significantly reduce energy consumption thanks to improved signal transmission system and a modern microprocessor. Thanks to the informative display with a blue backlit and intuitively understandable interface, the control process of LuxPRO thermostat is very simple. The display shows the current temperature, time, and day of the week. With a light touch the user can easily open a lid under the screen, and there all the necessary buttons for programming the device are located. Thus, this foldable lid hides the control buttons and makes the design of thermostat attractive and simple at the same time. The distinctive feature of a programmable thermostat is a timer that allows setting the temperature increase and decrease periods. The programmable mode provides the possibility to set up to four time periods with different temperatures on weekdays, as well as for the weekend. In addition to the five-day mode (5/2), it is possible to program separate settings for cooling and heating systems. The LuxPRO thermostat ensures a comfortable temperature in each of the indicated periods and saves energy by reducing the heating temperature when people are not at home. The power supply is provided by 2 AA batteries, which are included in the initial kit. According to the reviews, some users found this uncomfortable, but that a minor disadvantage as the device can work on batteries for a very long period of time. It can maintain a comfortable climate with the accuracy up to 0.25°F. And for the user’s comfort, the manufacturer has provided an adjustable temperature differential starting from 2.25°F. Based on reviews of the owners of LuxPRO PSP511LC thermostat, the device is very fast and easy to install in the house. They also note the ease of programming and adjustment process, which can be an important criterion for those who do not want to buy an abstruse product. Thus, for a reasonable price, you are getting a high-quality programmable temperature controller, which allows controlling the climate in the room in a very simple and effective way. Waking up in the morning, you will not have to run to the boiler or thermostat and adjust the temperature to warm the house. You’ll immediately find yourself at a comfortable temperature. LuxPro Digital 2 Wire Heat Only Thermostat provides a control of room temperature according to your needs and creates a comfortable and cozy atmosphere at your home, and a unique minimalist design perfectly complements your interior. Also, the use of this thermostat can achieve energy savings of up to 30%. Non-programmable LuxPro PSD010B thermostat works perfectly with the very different heating systems, for example, millivolt systems including wall heaters and fireplaces, some gas and oil systems with no fan, and 24V 2 wire heating-only and hydronic systems. Lack of compatibility with the cooling system can be a significant drawback for some users. This model of thermostat is powered by two AA batteries that come with a device. This greatly simplifies the need to install the thermostat near the AC outlet. The thermostat constantly maintains a user-defined temperature. PSD010B has a very simple control process. The small display with a backlight shows the current temperature. The desired temperature is set using the control buttons, which are located to the right of the screen. Pressing the “Up” or “Down” arrow buttons activates the control, so push them to set the desired temperature. When you release the button, the screen will return to the current temperature. In this case, it is not necessary to worry, in a couple of seconds, the thermostat will activate the heating device, and it will run until reaches a predetermined temperature. By the way, the buttons are pleasant to the touch. In reviews of this device, the owners indicate the ease of installation, which is possible thanks to only two wires provided. You do not need to spend half a day learning the wires connection plan or call a master to install the device. It’s all very simple. LuxPro Digital 2 Wire Heat Only Thermostat is a simple device with the digital accuracy that costs less than $50, but it copes with all the set tasks very well. You can be sure that the temperature is maintained at the required level. Despite its simplicity, the device has a nice design, which is much more pleasant than the old-school mechanical sliders models of thermostats. So you get a reliable stylish device and a comfortable climate in your home.